In researching this question, I found this article in USA Today. It recommends 10 outfitters around the country who offer dog sledding tours. Of the ten, only one is listed in Alaska (Paws For Adventure, Fairbanks). This outfitter is also one of the handful I had listed previously as warranting further consideration. The original dream was to fly in via bush plane to a cabin in the remote wilds of untamed Alaska. There we would be tested thoroughly for our ability not to freeze to death, starve, be eaten, etc. The dream is in large part a fantasy, not necessarily unrealistic, but to a great extent influenced by the movies we’ve all grown up watching. A mini is easy to do. You book a flight, call the outfitter, show up, putz around, fly home. Done. Flavor was good. Always better than nothing. Which often we hold out for the All-Or-Nothing trip, and end up with…you guessed it. Beginner trip is easy to sign up for. Learn the basics, get familiar with the rules, the equipment, the methods. You will not die. Turn around, and there’s probably a hospital behind you, next to the Starbucks. Ask your questions, get guidance, figure out how the whole sport works. Most important, GO! GET STARTED! When I decided to get certified for SCUBA, I called the local shop, signed up for the class, and got in the pool. There. Done. Next. Intermediate trip is going to push you a little more. You stood on the threshold of the great mountain before. You looked up at the mountain, said to your travel companion (or yourself), “I want to go up there,” pointing. And the guide told you, “Not this time, grasshopper. Next time.” Well, the intermediate trip is that next time. For example, you took your first 3-day dog sledding beginner’s trip on the fringes of Alaska (e.g. Fairbanks). You looked at the wilderness map below and pointed to the pink stuff right around the blue zone (but not in the middle of Alaska). There’s probably a town. That’s your intermediate trip. The Expert trip is stage 3. 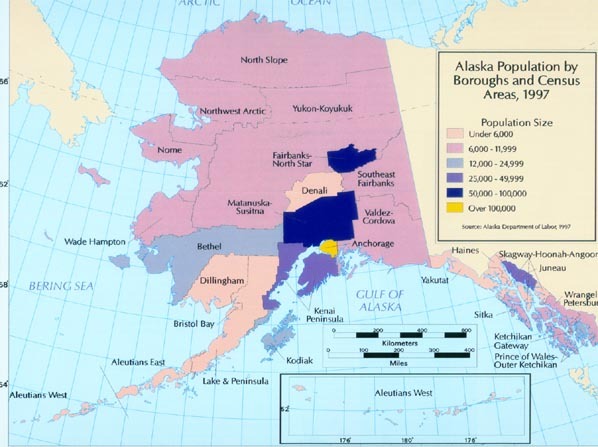 There’s no way in or out of the remotest, coldest, most heartless areas of northern Alaska except by bush plane. Food might be air-dropped in. You’re not taking this trip! This trip is beyond you! You’ve never even pet your first sled dog! Get real! Paws For Adventure’s 3-day Beginner’s trip appears to stay within 30 miles from home base in Fairbanks. Fairbanks is in Blue zone…50-100,000 people. Fairly safe. Their Alaska Range Expedition (I would say an intermediate trip: 5 nights/6 days) starts with a 3 1/2 hour drive from home base to Paxson, AK, which is southeast. All that pink stuff to the north and northwest of Fairbanks is Expert Territory. You can certainly go there. But do you know how to survive? How many people are there in the Yukon per square mile?